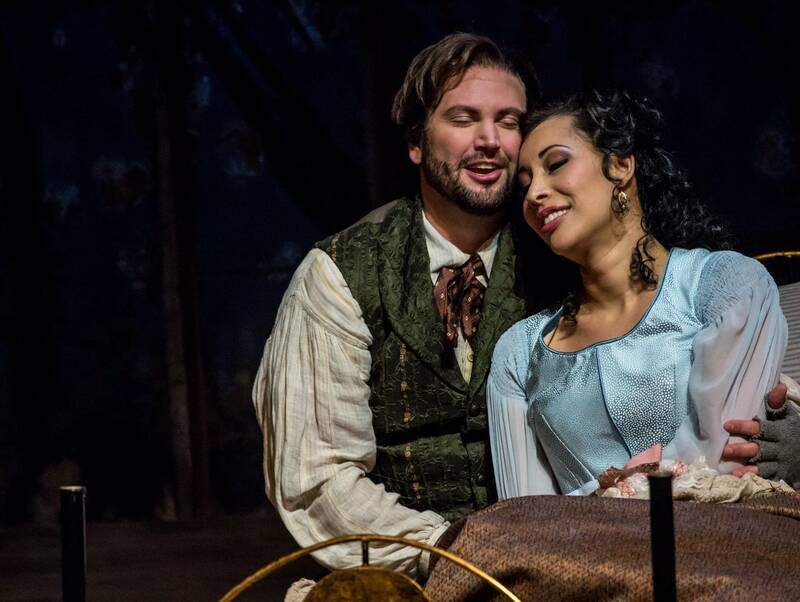 It snows onstage in La Bohème, but that's the least of the sorrows to be borne in Giacomo Puccini's famously weepy classic, which Minnesota Opera has brought to the Ordway in a production that hits all the highs and all the lows. All seems to be well — more or less — when the show breaks for an intermission after the second of its four acts. The lovably scrappy band of artists we met in Act I has just celebrated Christmas in high style, sticking the restaurant bill to a sugar daddy who then gets dumped anyway by their compatriot Musetta, returning to the arms of her ex, the painter Marcello. Things are even duckier for the poet Rodolfo, who's fallen deeply in love with an endearing seamstress named Mimì. When the curtain rises on Act III, everything's gone to heck. Rodolfo's abandoned Mimì in an irrationally jealous rage, Musetta and Marcello are living together but fighting, and Mimì has an ominous cough. (Opera characters never cough unless it's the consumption.) Oh, and it's snowing. The 1896 opera is one of the most popular of all time — the only two performed more often are La traviata and Carmen — and the Minnesota production handily demonstrates why, capturing both the boisterous camaraderie of the artists in their garret and the lambent love that the characters sing about in some of the repertoire's most beloved arias. For this nine-show run, unusually long by Minnesota Opera standards, two casts alternate in the leading roles. For Saturday's opening night performance, the ill-fated Mimi was embodied by the powerful but pleasantly understated Nicole Cabell, paired with a strongly emotive Scott Quinn as Rodolfo. There's nothing understated — nor should there be — about Mary Evelyn Hangley's boisterous Musetta, and in this cast Edward Parks has the role of the painter who just can't quit her. The singing is only half the story, though, and conductor Michael Christie (who alternates at the podium with chorusmaster Jonathan Brandani) brings Puccini's score to rippling life, reminding us why they call it the Romantic era. Stage director Octavio Cardenas is closely attentive to the music's nuances (such as they are — this is Puccini, after all), and lighting designer Marcus Dillard underscores the sweeping emotions. Michael Yeargan's set evokes both the bustling streets of Paris (in Act II) and those streets' more ominous corners (Act III). The opera both begins and ends in the humble — but free, since they're blackmailing the landlord — apartment the artists share, literally freezing yet warm with bonhomie. Through the translucent walls of the apartment, which rises up at center stage, the characters cast shadows against the skyline of the City of Lights. At the end of Act II, a crowd fills the stage for a military parade, proudly waving flags. As France heads to the polls for a dramatic election that will determine the country's future, La Bohème is a poignant look back: a vision of a Paris where young hearts run free, where even sad endings are reminders of joyful beginnings. Listen to La Bohème's Nicole Cabell and Miriam Khalil talk with Julie Amacher in this archived Perf Chat. Also, tune in to Classical MPR every weekday May 8-13 at 10 a.m. to hear Puccini arias chosen in honor of this production — and on Thursday, May 11, at 7:30 p.m. we'll be airing Minnesota Opera's La Bohème live.